Adam and his friend Boles—both formerly farmers—sat in a small compound encircled by a straw fence in Sherkole refugee camp in far western Ethiopia. Nearby, a group of women crowded together on a plastic blue mat preparing food. 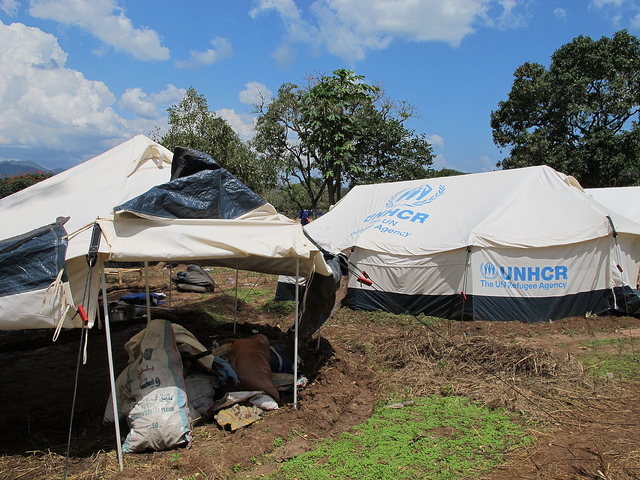 A single tent, emblazoned with the UNHCR logo, stood in the corner. Adam was responding to a question posed by Enough about whether he, Boles, and the other men who had gathered, sensed political tensions in their state prior to the outbreak of conflict that drove them from their homes. That morning was 4 a.m. on September 2, according to Boles, when the northern and southern components of a joint military unit in Kurmuk began fighting. Created under the 2005 peace agreement, the Joint Integrated Units, or JIUs, were meant to serve as the core of a new national army, had Sudan and South Sudan remained united. In Blue Nile, the northern component was comprised of the Sudan government army, or the SAF, and the southern component was made up of Blue Nile natives who had fought on the side of the South during the civil war. The soldiers native to Blue Nile are now among those fighting against government forces, in an attempt, the rebellion’s leaders say, to change the regime. Around 10 a.m., the bombings in Kurmuk began. “The reason the civilians started running was because of the Antonovs,” said Boles. The bombs were “targeting the civilian areas.” He contrasted this to the clashes between combatants, which took place around the JIU barracks outside of town—notably, where no bombings took place, Boles added. When the air raid began, some of Kurmuk’s residents ran straight to the border, some ran into the bush, and others ran further into Sudan, Boles said. He and his entire family made it safely to Sherkole camp, but the family was left with nothing. “The Antonov does not give you any chance of salvaging anything. Even if we had the chance, what can we take since we are running?” he asked. When you see the planes coming, “you don’t think of anything but saving yourself,” another man from the group, Elijah, said, adding that he witnessed five civilians killed by a bomb. The men said that in retrospect they suspected some of their neighbors in Kurmuk had been warned of the government attack. Even as the men expressed feelings of discrimination, Adam acknowledged that the refugees’ growing sense of division from their former neighbors is a consequence of the resumption of war, and he suggested the tension is not insurmountable. Even with the diversity of Kurmuk, relations between the different communities had been peaceful prior to the fighting, Adam said. And were it up to the civilians, he stressed, the social fabric in Blue Nile would remain intact. But even among this self-described apolitical group of farmers-turned-refugees, the rebellion led by the Sudan People’s Liberation Army-North, or the SPLA-N, was seen as a valid response to what they saw as government provocation. “They are our army, they are defending us,” Elijah said. This post is part of a series based on Enough interviews with Blue Nile refugees in Sherkole refugee camp and Kurmuk, Ethiopia. Details of these testimonies are impossible to verify, but accounts Enough heard have been generally consistent. Some names have been changed to protect the identity of the speaker. For background details about the conflict in Blue Nile, read our overview dispatch.